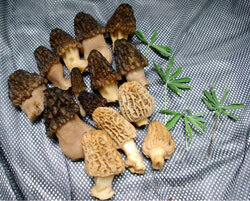 April Showers Bring May ... Mushrooms? 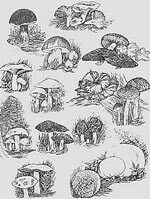 If, in fact, April showers do bring May mushrooms, we should be up to our eyeballs in fungi any day now! It has been a pretty wet spring all over the Northwest, and especially here on the southern Oregon coast. We've had an occasionalnice day or two, but there has been a lot of rain around these parts (including a particularly nasty storm May 4th with a peak gust of 83 m.p.h. and 2-1/2" of rain), and we're more than ready for some consistent sunshine. While those of us who live on the southern Oregon coast often have hummingbirds the year around, Oregonians who reside further north are limited to the summer months. Our friends and neighbors near Mt. Hood, Bill and Barbara White, are especially fortunate in the hummingbird department this year. 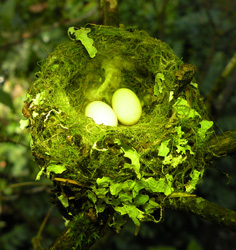 A little female - we think it's a Ruby-Throated, but aren't sure - hummer has constructed a tiny nest just outside their kitchen window, and a peek inside it in the first week of May revealed the presence of two precious little eggs! Bill got this unusual picture of them without overly disturbing the mom, who immediately returned to the nest when Bill and his camera left the area. A rare and unusual photo! Sadly, subsequent cold rain and wind caused the little hummingbird to leave, and she hasn't been seen since. 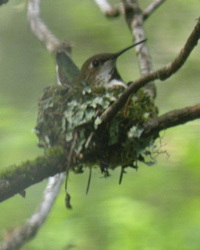 Hopefully, she'll build another nest in a more protected spot, and succeed at motherhood yet. What a spectacular addition to our appetizer table! Colorful and flavorable and bursting with bold flavors! We found Roxanne Chan's submission to our recipe contest to be particularly intriging. into bloom on the Southern Oregon coast. 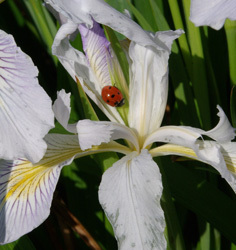 of a ladybug enjoying an iris. There were so many yummy recipes submitted in response to our recipe contest this year! And, one of the most tempting was the following from Lisa Heine. We loved not only the burst of flavor when we bit into the appetizers but also the aromas that resulted from the combination of mushrooms, cheese and truffle oil. What a treat - thanks, Lisa, for sharing the recipe with us. 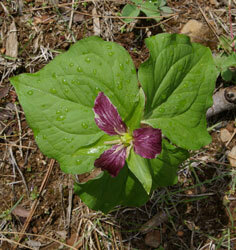 forest floor after the winter's pounding rains.